Weegee was well known for his gritty yet compassionate images of the aftermath of New York street crimes and disasters. In a rare 1958 interview Arthur Fellig (Weegee’s real name) talks about getting the shot and gives advice to anyone wanting to become a news photographer. Full interview after the jump. 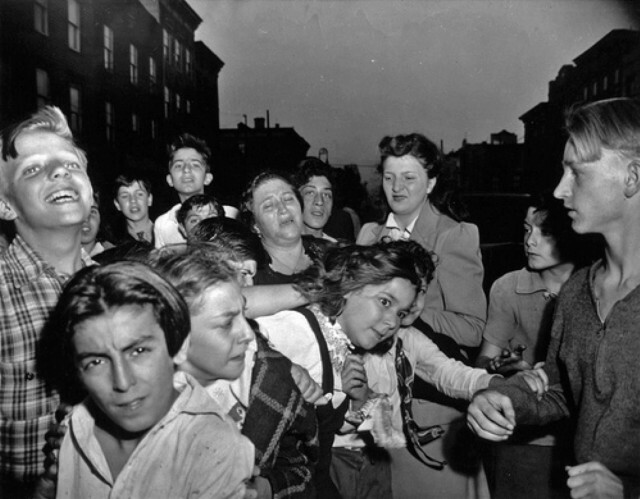 Weegee is considered by many to be the original street photographer. Even though he was by trade a news photographer, his compassion and insight into the human condition sets his work apart from any of his contemporaries. He would sleep fully clothed so he was ready to go if the police radio reported a crime in the middle of the night. He was so quick that he’d often get to the scene before the police and was even known to take liberties with evidence – moving a hat or purse to get a better shot! He shot with a 4×5 inch Speed Graphic camera that allowed only a single shot at a time. He would often develop his images in the trunk of his car and his prints were stamped the back with his trademark “Credit Photo Weegee The Famous” then hand delivered to the newspaper each night. It’s easy enough to treat news photographers as artless gatherers of facts but this interview pulls the veil back on the man and reveals a true photo enthusiast that is fascinated by the people he photographs. It’s interesting to hear a man known for taking photographing murder scenes talk about photography as if he was a hobbiest. Something we should all strive to be! The subject is news photography, this is the most wonderful experience for any man or woman to go through. It’s like a modern Alladin’s lamp, you rub it (in this case the camera), you push the button and it gives you the things you want. News photography teaches you to think fast, to be sure of yourself, self confidence. When you go out on a story, you don’t go back for another sitting, you gotta get it. And, i have found, cover stories as they happen. In my particular case i didn’t wait until somebody gave me a job or something. 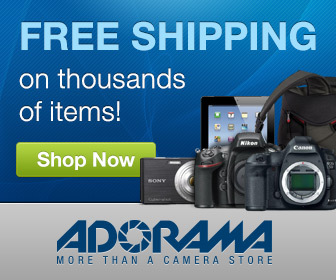 I went and created a job for myself – freelance photographer. and what I did, anybody else can do. What did simply was this. I went down to manhattan police headquarters, for two years I worked without a police card or any kind of credentials. When a story came over the police teletype I would go to it. And the idea was I sold the pictures to the newspapers and naturally I picked the story that meant something. In other words names make news. If there’s a fight between a drunken couple on third avenue or 9th avenue in Hell’s Kitchen nobody cares. It’s just a ballroom brawl. But if society has a fight in a Cadillac on park avenue and their names, they’re in the social register, this makes news and the papers are interested in that. I covered all kinds of stories from Murder Incorporated, to the opening of the opera, to a Cinderella Ball at the Waldorf. In other words you take everything in stride. The same camera that photographs a murder scene can photograph a beautiful society affair at a big hotel. Now the easiest kind of job was a murder because the stiff would be laying on the ground. He couldn’t get up an walk away or get temperamental and we would be good for at least 2 hours. So i had plenty of time. At fires you had to work very fast. One of the best pictures i’ve made, just to give you a little aside – I got up at 9 o’clock one night and i says to myself I’m gonna take a nice little ride and work up an appetite. I arrive right in the heart of little Italy – 10 prince street. Here’s a guy had been bumped off in the doorway of a little candy store. This was a nice balmy hot summer’s night. 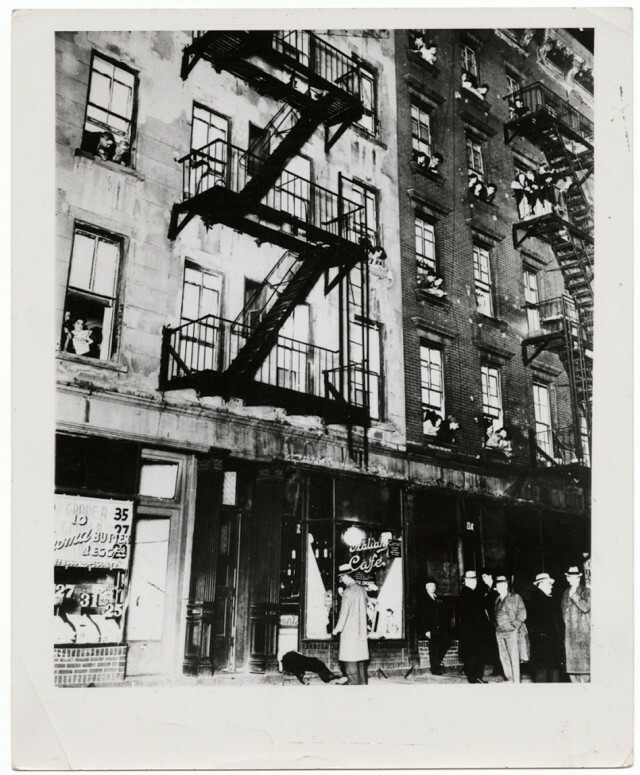 The detectives are all over but all the 5 stories of the tenement people are on the fire escape. They’re looking and having a good time. Some of the kids are even reading the funny papers and the comics! There was another photographer there and he made what you call a 10 foot shot. He made a shot of just a guy laying in the doorway, that’s it. To me this was drama. This was like a backdrop. I stepped back about a hundred feet. I used flash powder and i got this whole scene. The people on the fire escapes, the body, everything! Of course the title for it was “Balcony Seats At A Murder.” That picture won me a gold medal for a real genuine diamond. So that was it. I tried to humanize news story. Of course I ran into snags with the dopey editors. If it was a fire they’d say, “Where’s the burning building?” I says, “Look, they all look alike!” I says, “Look, here’s the people affected by the burning building.” Well some understood it and some didn’t. In one case i went to a tenement house fire. Here’s a mother and daughter looking up hopelessly. Another daughter and body are burning to death! Now at a fire, what happens, those who are lucky to get out of the burning tenements gather in the street of course. And then the firemen start counting noses, they want to see how many people are there. And i noticed also at this particular fire, the aid to the chief came out and he says, “Boss this is a roast.” Meaning somebody, one or more persons, had burned to death. That’s what the firemen call a roast. And I saw this woman and her daughter looking up hopelessly. I took that picture. To me that symbolized the lousy tenements, everything else that went with them. So in other words, I’m a perfectionist. When I take a picture, if it’s a murder or if it’s a drunk. it’s gotta be… GOOD. When a person gets themselves arrested the first thing they do they cover up their faces and editors don’t like it. They say don’t give us any excuses give me a picture so our readers can see what the person looks like. For example, a woman, the New York cops arrested a woman who was wanted for $25,000 jewel robbery in Washington D.C. The woman, being a dope, was naturally captured. and she was in a cell downtairs in the basement of manhattan police headquarters. I said, “Now wait a minute lady, don’t be so hasty, you have your choice. Would you like your picture to appear in the papers, a rogues gallery picture with your number underneath it? Or would you let me make a nice home portrait study of you. Using nice soft lighting like Rembrandt would have done?” Talking and knocking with her I convinced her the only logical thing for her to do was pose for a picture. Now that was a good catch, you know, I’d say, for me, besides the new york cops. Anyway this showed that by arguing with people you can get them to uncover. People are reasonable. Even jewel theives. And the way to start off is you have a police radio in your home. Something happens in the immediate neighborhood go to it. Take pictures of it. Take it down to the local paper. After a while they will give you assignments. They will learn to depend upon you, instead of waking their own photographers during the night they will call upon you. And this will be followed up by an offer of a job. And this is a very good way to get started. Now for instance say you have a camera, you make good pictures, everybody like them. But you have to get out of the class where you only photograph your friends and relatives indoors. That’s very nice but if you want to do it professionally (and I don’t see any reason you shouldn’t) go out and photograph strangers. I know you’re afraid to do it first. I was scared stiff myself. But you have to do it. And most people like to be photographed. They consider it an honor to be picked out of a big crowd. In other words, you can’t be a nice nelly and do photography. 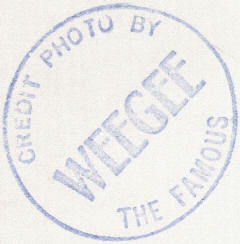 What’s your take on Weegee? Dated reference to a byegone era? Or one of the true fathers of modern street photography? Post your ideas in the comments below and keep the conversation going!